Here are some of our latest mobile games! You can download them for free and play them together with your friends. The first game I will show you is a wedding game. One more hour and the big wedding party will start. There’s still a lot to do to transform this girl into a radiant bride. So pick some facial masks, lotions and creams and get busy! You can choose from all kinds of bridal hairdos, hair colors, dresses, bridal bouquets and so much more. 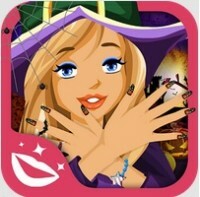 The second game is called Halloween Party Nails. It is a fun game in which you have to help two friends with their nails. It is almost Halloween and they are invited to an awesome party! They are already dressed up, and need your help with the finishing touches. Help them with their nails, they should be the highlight of the party!